Towards the end of the ministry of Jesus, His sermons were not so much friendly but instructive and full of rebuke (Matthew 23-25). I guess people were no longer giving (offerings) to His ministry like before, and by that Judas the treasurer (see John 13:29) no longer had enough money to keep both for the ministry and to himself. Meanwhile, this treasurer needed money to complete the payment of his land and start building on it ASAP, because he was not sure whether following Jesus, who was about to be crucified, would profit him anything (Matthew 26:2). To worsen the case for Judas the treasurer, Jesus supported the woman who was alleged wasteful by His disciples (see Matthew 26:6-13, Mark 14:3, John 12:1-8), instead of Him telling the woman to sell the oil and bring the money. Judas had no choice but to activate Plan B since Plan A seems to be running out. Wondering what Plans A and B were? Plan A – Judas used to help himself to what was put into the money bag, he was a thief (see John 12:6). Plan B – To go to the chief priests and betray Jesus in exchange for money (see Matthew 26:14-15, Mark 14:10-11, Luke 22:3-5). He had to set plan B in motion. His house must be completed before the next Christmas. So, for thirty pieces of silver, he betrayed Jesus (see Matthew 26:15) and his dream of celebrating New Year in his own house was fast becoming a reality. He planned to be among the testifiers on New Year Thanksgiving Sunday. After Jesus had been condemned to death on the cross, Judas who betrayed Him became remorseful and returned the blood money. But it was too late. He was daily haunted by the memory of his greedy business transaction. Instead of erecting a fully air-conditioned duplex on the land he had purchased, he killed himself on it (see Matthew 27:5, Acts 1:18). What a sorrowful and pitiful end for one who had been with Jesus, one with unlimited supernatural potentials. What a pity! As a result of his unrepentant greed, not only did Judas die but he also lost his exalted position as part of the Twelve Apostles of Jesus and pioneers of the Church of Christ. He did not see the days of the Holy Spirit that even Gentiles are partaking of till date. His home became desolate and another person took his leadership position. Surely, what Judas lost cannot be compared to thirty pieces of silver. Today, there are many known with Jesus. Some even hold one position or the other in their local churches, admired and esteemed by people. But they are like Judas – following Jesus closely but secretly pursuing his own selfish ambitions. He was a follower leading himself. He had done several Retreats and Bible Studies with Jesus. In fact, he could regurgitate all the teachings and commandments of Jesus but he would not obey any. He followed Jesus – for personal gain. At the renewal of all things – the regeneration, will Judas’ name, who was numbered with the Twelve, be on one of the foundations holding the wall of the Great City – The Holy Jerusalem? Will this man, who healed the sick and casted out demons, also sit on one of the twelve thrones judging the twelve tribes of Israel? (see Revelation 21:10,14; Matthew 19:28). What about you reading this? Are you like Judas? Will you be sitting at the right hand of Jesus or his left hand-side? Will you be counted among the sheep or the goats? Your actions and inactions today, will they take you to Heaven or Hell? Only you can answer these questions. 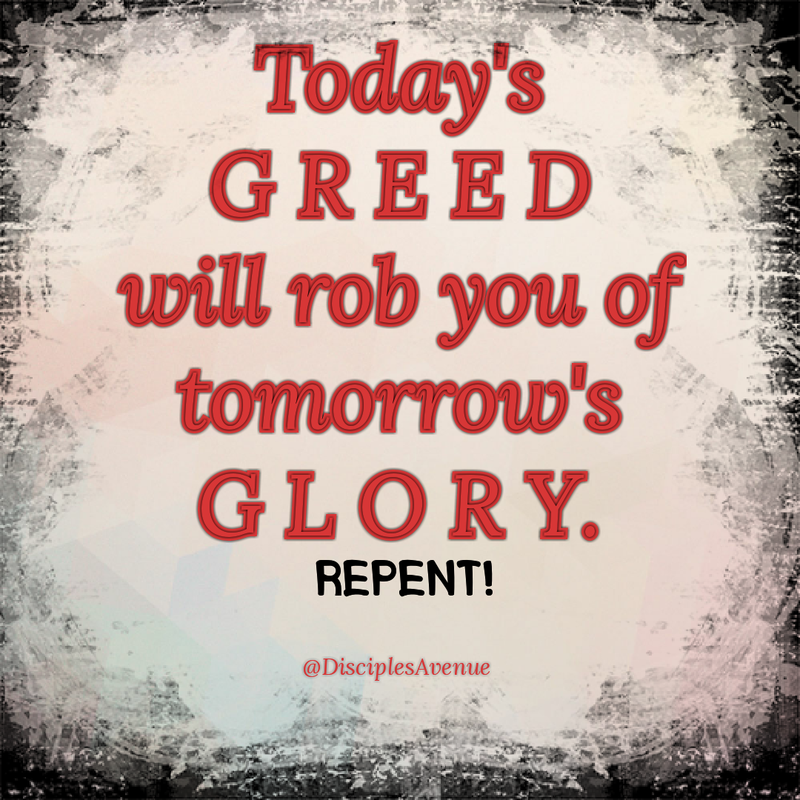 Today’s greed will rob you of tomorrow’s glory. Repent! And amend your ways before it is too late. Do not be like “GREEDY JUDAS”. May God empower you by His Spirit, as you take steps to live as a true follower of Jesus. Amen!